This acrylic 4 section patio dish, on ice tray, is a nice addition for any dinner table because it is designed with simple lines and square edges. Ice filled bottom tray keeps dips, fruits and vegetables fresh and cool for hours, so they will not spoil. As the ice melts, cool air rises to chill the food in the cups above it. 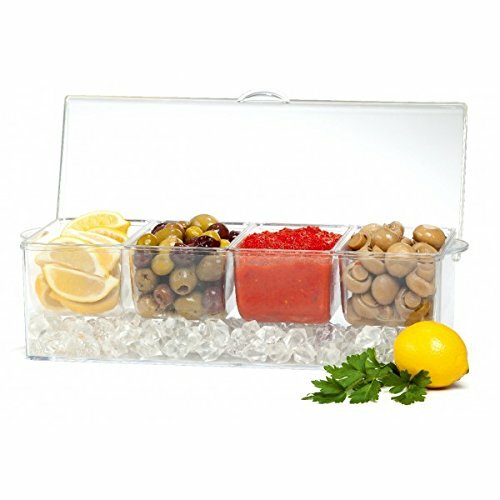 The integrated lid helps keep things fresh, and also traps more of the cool within the tray to maximize the ice's chilling power.This chilled condiment caddy keeps condiments deliciously fresh and cool.